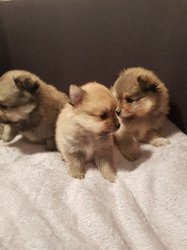 2 girls and 1 boy Pomeranian puppies raised in the family home, with lots of love and attention. Before will be leaving our house. His lovely funny playful characters and love a cuddle. 11weeks purebreed 2 girls and 1 boy pomeranians, has already been wormed, microchip-ed, vaccinated, health- checked. He will come with full puppy pack, information leaflet and and vet papers too as well.